Recently, China Education Online released the 2018 annual list of big data universities, and Southwest Minzu University (SMU) won “2018 Top 10 Most Searched Universities in Sichuan”. Marching ahead of time. SMU, located in the national historical and cultural city, Chengdu, known as the Land of Abundance, is a pearl of national higher education embedded in the southwest China, impregnated with the delicacy of Mounts Qingcheng and Emei, and clinging to the essence of Wuhou Temple. SMU, formerly Southwest College for Nationalities, is a multi-disciplinary higher education institute directly under the control of the State Ethnic Affairs Commission (SEAC). The university was founded in July 1950 and officially established in June 1st, 1951, and changed its name into Southwest University for Nationalities in April, 2003 (which changed its official English name into Southwest Minzu University in 2016). In 2005, SMU was jointly subordinated to the SEAC and Chengdu City. In 2015, it was cooperatively administrated by the SEAC, the People’s Government of Sichuan Province and Ministry of Education. In 2016, a strategic cooperation agreement was signed between the People’s Government of Sichuan Province and SMU. Southwest Minzu University was one of first established national universities since the founding of New China in 1949, with the full support of proletarian revolutionaries of the older generation, such as Mao Zedong, Zhou Enlai, Deng Xiaoping and Wang Weizhou. The university carried forward the fine traditions of Yan’an College of Nationalities (merged into Yan’an University in 1942) established in the War of Resistance against Japan. Bathed in the initial rise of People’s Republic of China and invigorated in the reform and opening up, now SMU has been working hard to stride into new era. In 2003, SMU was deemed the outstanding university in the first round of Evaluation of Undergraduate Teaching Quality. And in 2017, it received titles of the first National Civilized Univesity and the fifth National Demonstration University for Ethnic Unity and Progress. Passing on the spirit of scholarship. SMU has always adhered to the mission of “serving minority ethnic groups and minority areas, and devoting to the national development strategy”, and proceeded with continuous exploration. With SMU people blazing their way forward through all the difficulties and advancing victoriously, SMU now has set 12 fields of study comprising literature, history, philosophy, economics, management, law, education, science, engineering, agriculture, medicine and art. With covering an area of nearly 3,000 mu and 1120,000 square meters for construction area, it has three campuses, namely, Wuhou campus, Hangkonggang campus and Taipingyuan campus. In addition, the university maintains the Qinghai-Tibetan Plateau Ecological Environmental Protection and Advanced Technology for Animal Husbandry in Hongyuan County, Ngawa Tibetan and Qiang Autonomous Prefecture. It also boasts distinctive national museum containing the world largest Tibetology pavilion and Yi Study pavilion. SMU has more than 30,000 full-time students of 56 nationalities and over 3,000 staff members, including 500 doctoral and postgraduate supervisors. The university has gathered industrious teachers with rigorous scholarship, among which 51 experts have enjoyed the special government allowance of the State Council; and two leading academics on philosophy of the social sciences of the state’s Ten Thousand Talent Program and masters in culture of the Publicity Department of the CPC as well as talents of the Four “First Batch” Program. Furthermore, there are one young top-notch talent of the state’s Ten Thousand Talent Program, 37 foregoers of Sichuan academy and technology, 25 experts of outstanding contributions for Sichuan Province, 8 experts of outstanding contributions for the SEAC, eight leading researchers of the SEAC, one leading innovative talent and one young talent of Sichuan Thousand Talent Program, 8 talents of Outstanding Talent Support Program in New Century of Ministry of Education, 17 young and middle-aged talents of the SEAC, 83 alternative foregoers of Sichuan academy and technology, three renowned teachers of Sichuan Province, two won the First SEAC Renowned Teacher, one was awarded the First SEAC Young Teaching Model, and 35 SMU renowned teachers. Endeavor for a bright future. SMU now consists of 24 colleges. There is one mobile post-doctoral station, 3 doctoral degree-level subjects, 24 master's degree programs, 14 professional degree programs, 85 undergraduate programs, of which 5 subjects are provincial key disciplines; 13 majors have been approved as provincial and higher-level “outstanding talent training programs”. In the midst, 4 majors have been selected as national-level “outstanding talent training programs”. There are 6 national-level undergraduate specialties, 10 provincial undergraduate specialties, 19 double degree majors, 5 provincial undergraduate talent training bases, 2 provincial experimental teaching demonstration centers, 1 provincial virtual simulation experimental teaching center, 1 key laboratory of the Ministry of Education, 10 provincial and ministerial key laboratories and 1 provincial engineering technology center. At present, the university’s library has collected more than 9.8 million books and materials (including electronic documents). The total value of teaching and research instruments and equipment is 519.8 million yuan. The digitalization of campus has achieved remarkable results. The university is the national “Outstanding Law Talent Training Base”, “National Minority Preparatory Education Base”, “National College Practice Education and Innovation Base”, “Central Subordinate College Students' Off-campus Practice and Education Base”, “SEAC Bilingual Talent Training Base”, “Top 50 Universities with Typical Employment Experience” and “Top 50 Universities with Typical Experiences in Innovation and Entrepreneurship”. SMU has been rated as “Advanced Collective for Employment of Sichuan Graduates” for seven consecutive years. Casting brand and displaying characteristics. SMU has undertaken more than 400 national-level scientific research projects since 2000, including 18 key programs of the National Social Science Fund, 11 major projects and topics such as the National Science and Technology Program, 18 National Art Foundation programs, and more than 1,300 provincial-level scientific research projects. “National Yi Terminology Standardization Working Committee” “National High Institutions Compilation and Validation Committee for Yi-Chinese Bilingual Textbooks” are affiliated to the university. “Sichuan Ethinic Education Development Research Center” is also anchored to the university. The SEAC, Ministry of Culture, Chinese Academy of Social Sciences, Sichuan Province, and the China Association of Productivity Science have established in SMU the SEAC Cultivation and Research Base of Minority Ancient Literature Documents, the Southwest Research Center of the National Folk Literature and Art Development Center of the Ministry of Culture, the Southwest China National Language Resource Pool Construction Base, the National Bilingual Judge Training Base, Sichuan Provincial Cadre Education and Training Base, Sichuan Minority Bilingual Education Popularization Base, Sichuan Intangible Cultural Heritage Research Base, and China Productivity Science Research Institute. 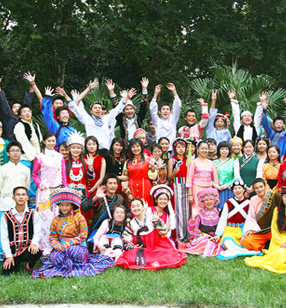 The published academic journals mainly include the Journal of Southwest Minzu University and the Journal of Ethnology. The Journal of Southwest Minzu University (Humanities and Social Sciences Edition) has been selected as a CSSCI source journal and a core Chinese journal of Peking University for many years. It has been regarded as an authoritative journal of Ethnology and Culture by the Chinese Academy of Social Sciences. The Journal of Ethnology is also selected as a core Chinese journal of Peking University. Open to multiculturism. 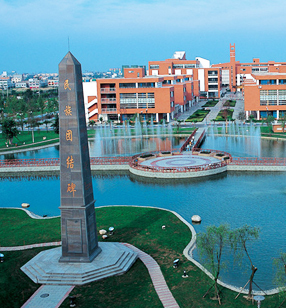 SMU is a major institute for Sichuan Province to open to the outside world. In recent years, it has developed strategic cooperation relationships with 18 prefectures and counties in 7 provinces and municipalities including Sichuan, Yunnan, Guizhou, Hunan, Qinghai, Tibet and Chongqing. Besides, it has established industry-university-research cooperation relationships with enterprises and institutions for scientific research. SMU has contributed to the poverty alleviation of the Wulingshan area, and the counterpart-assistance to Hongyuan County and Zoigê County in Aba Prefecture, and Yanyuan County in Liangshan Prefecture, which is entitled Advanced Unit in Sichuan Counterpart Poverty Alleviation. SMU has always endeavored to promote international exchange and cooperation. Now experts, scholars, and officials form more than 70 countries and regions have come to make academic exchanges. It has had intercollegiate cooperation and exchanges with more than 60 universities and research institutions at home and abroad including Munich University, Columbia University, University of California, Riverside, University of California, San Diego, University of Virginia, Hosei University, Australian National University, and Fu Jen Catholic University. Nearly 1,000 students have been sent to study abroad, and more than 6,600 international students from more than 70 countries have been recruited. The university carries forward the core values of socialism, solidly promotes the education of national unity, encourages exchanges between teachers and students of 56 ethnic groups, and the multicultural exchanges of all ethnic groups bloom and complement each other. Teachers and students of all ethnic groups share the same feelings and help each other, creating a humane environment of unity, amity and harmony, where you can get along and progress together. The university insists on educating students by culture and moral, and actively carries out campus activities in various forms, and healthy and elegant style. 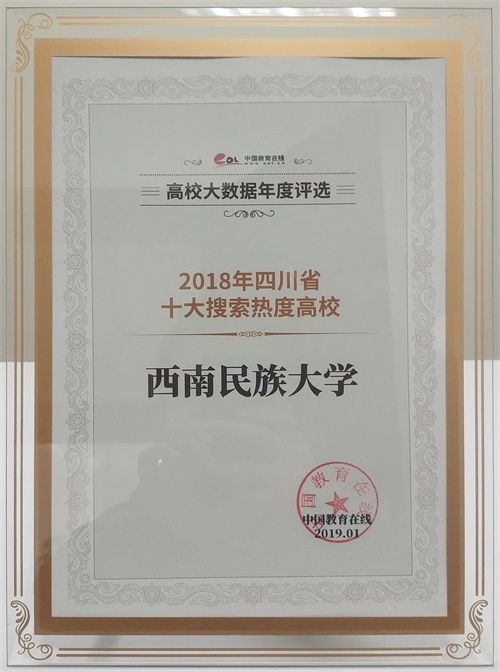 Many achievements of cultural construction have won the special prize and the first prize of outstanding achievements in campus culture construction among Sichuan universities and nationwide. The National Museum is the “National Unity and Progress Education Base” and the “Sichuan National Unity and Progress Education Base”. Students over the world. Since the founding of the university 67 years ago, a group of students from all ethnic groups have been away from the campus to make contributions. Among the 200,000 graduates of all ethnic groups, the first Tibetan doctor and Yi doctor emerged after the founding of New China in 1949, and the first batch of Tibetan generals trained by China itself sprung up. Many famous experts and scholars at home and abroad and a large number of officials also appeared, who have devoted themselves to the development of ethnic areas and the cause of national unity and progress, and become the “permanent card” talents in the ethnic areas. From Tibetan snowy area to the Tianshan Mountains, thousands of students who are represented by these outstanding alumni actively practice the core values of socialism, shoulder responsibility with blood and loyalty, and give back to the motherland with youth and life. They have made outstanding contributions to safeguarding the motherland’s reunification, national unity, borderland stability, and promoting economic development and social progress in ethnic areas, and have played an irreplaceable role. Going forward to better SMU. Guided by Xi Jinping’s socialism with Chinese characteristics in new era, the university thoroughly implemented the spirits of the 19th National Congress of the Communist Party of China, the Central National Work Conference, the National College Ideological and Political Work Conference, and National Undergraduate Education Work Conference in the New Age, firmly grasping the university’s direction in the socialist society, comprehensively implementing the educational policy of the Party and the state, carrying out the fundamental tasks of the morality education. With the construction of “Double First-Class” initiative of the country, SMU will continue to carry forward the spirit of “Consensus for being tuneful, Confidence for being powerful” and closely follow the university’s “three steps” development goal, implementing the “Three Major Strategies, Eight Comprehensives” construction tasks. Furthermore, SMU will further highlight the talent-oriented training, deepen the comprehensive reform of education and teaching, improve the quality of education, and endeavor to build a distinctive and high-level university, thus contributing to the Chinese dream of realizing the great rejuvenation of the Chinese nation.